Well it’s not an easy guess: both have joined the UNESCO’s list of world’s cultural treasures yesterday. No, I’m not talking about president Nicolas Sarkozy and his wife Carla. 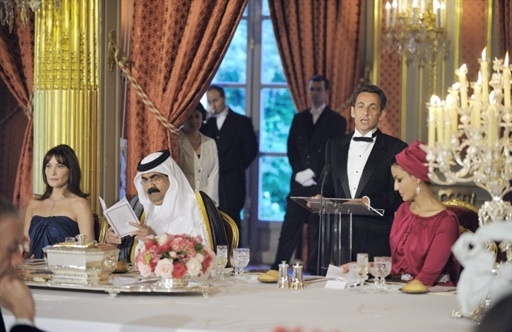 Neither about Qatari Emir Sheik Hamad Bin Khalifa Al-Thani and his lovely wife Sheika Mozah Bint Nasser Al-Misnad. Although, don’t get me wrong, they definitely deserve this distinction too. I’m talking about the “gastronomic meal of the French”. The classical everlasting dinner just like at the Elysée Palace seen in this photo. It’s exactly that kind of gastronomic dinner (or lunch), which will be from now on part of the “intangible cultural heritage of humanity”. Why? You might think, do the French always have to do it differently, and when it comes to meal they do it differently too. They actually do. The UNESCO experts singled the French gastronomic meal out as a “social custom aimed at celebrating the most important moments in the lives of individuals and groups”. That sounds quite technical. They actually mean that: the French sit down! The French spend an enormous amount of time around the table! And the French talk endlessly when eating! „A meal is an experimental laboratory for a food culture, it brings together all of its quirks and customs," said Annick Vin of the French heritage and gastronomy mission (MFPCA) in charge of submitting the case. She is talking about how wines are paired with dishes, how the table is dressed, the precise placing of glasses, for water, red and white wine, knife blade pointing in and fork tines down. All this is seen as part of the rite, the social practice. Well, it isn’t a myth. A dinner for friends or the traditional family lunch on Sundays are indeed often prepared a bit like state banquet: from aperitif to amuse-bouches, starter, one or two main dishes, cheese and dessert, rounded off with mignardises - little nibbles of nougat, chocolates or candied fruits, with of course coffee to finish... And like a state banquet it lasts, and lasts, and lasts, often to the delight, but some times much to the regrets of the guests. But why did the French apply for this honour and want their gastronomic meal on the world heritage list? Do they think that their food culture is in danger? They would never admit this.